← Oil from Plastic waste. Now spring has arrived we decided to grill outside more often. To spice up the menu I bought a generic grill rotisserie so we could try to cook different ways. Our grill is a 20 year old Sunbeam which is not made any more. It has a glass see through front which is hard to find now days on an out door grills. 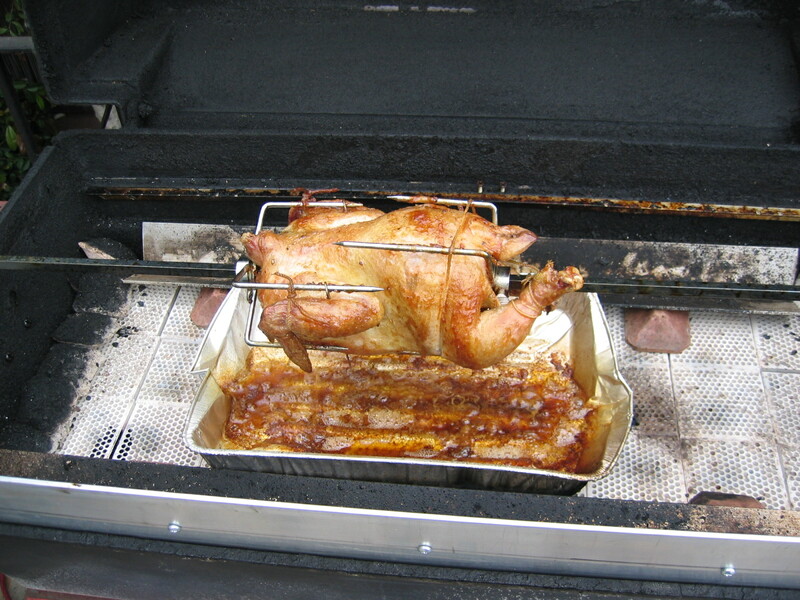 So I had to jerry-rig the generic rotisserie that I bought at Lowes for $30. The unit fitted without too much problem, just a slight modification to the brackets. 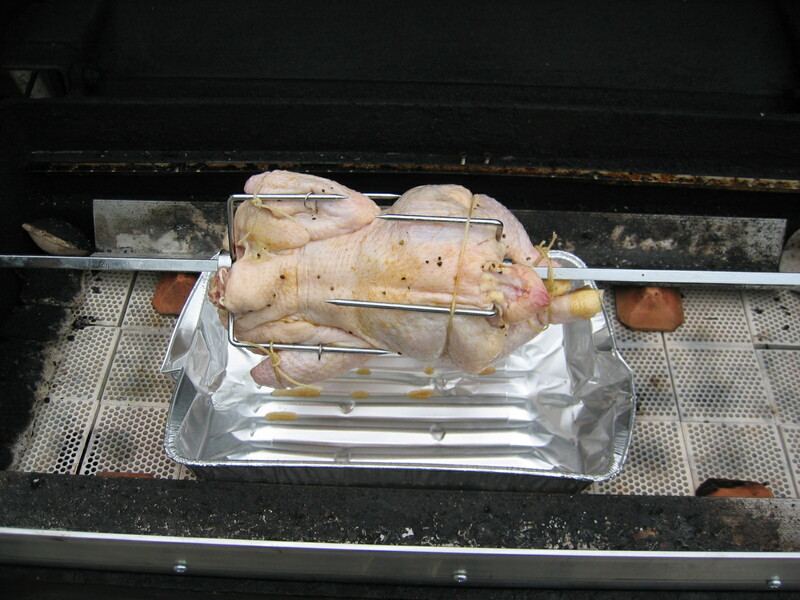 The rotisserie worked well except the grill lid would not close without clamping down on the rod. As you can see without the aluminum spacing the lid would clamp on the rod. I had to figure a way to not close the lid of the grill all the way down. I finally came up with a 4" strip of aluminum which wrapped around the front of the grill to stop the lid closing all the way and also acted as a front cover to keep the heat in because the lid was not closed l the way. It was hard to find 4" aluminum locally so I bought a long 2" strip, cut it in half and screwed the edges together with self tapping screws to make a 3.5" strip which was just enough to give me the required spacing. Now the grill is ready we bought a chicken to test the rotisserie. We bought the smallest chicken we could find as we did not know how much clearance around the chicken was needed. There was plenty of room. Future chickens will be normal size. 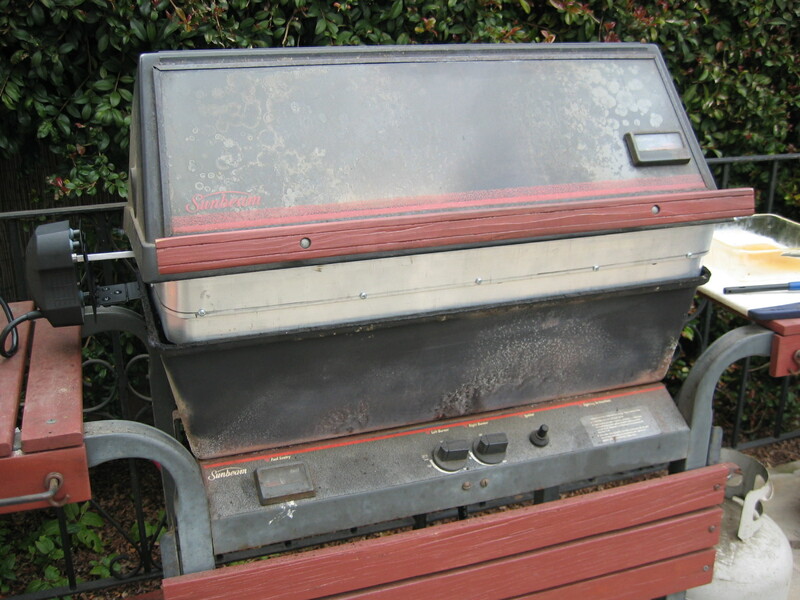 Now not only was the idea of the rotisserie to cook different types of meat and save money as retirees, but instead the cost of the rotisserie, aluminum strip and time involved building the unit became expensive. This entry was posted in Lifestyle and tagged BBQ, retirees, rotisserie. Bookmark the permalink.